The sale of tourist packages, regarding services to be provided both domestically and internationally, is governed by law 27/12/1977 n. 1084, ratifying and implementing the International Convention on Travel Contracts (ICTC) signed in Brussels on 23.4.1970 as well as the Tourism Code, Legislative Decree. 23/05/2011 n. 79, henceforth Cod. Tur. (Arts. 32-51), and its subsequent amendments. b) tourist: the buyer, the person who purchases the tour package, or any person also to be appointed – as long as he or she meets all the conditions required for using the service – on whose behalf the principal contracting party agrees to purchase a tour package without receiving any remuneration. tourist packages regard trips, holidays, “package tours”, tourist cruises, resulting from the combination, created by anyone and in any way, of at least two of the elements indicated below, sold or offered for sale at a flat rate: a) transport; b) accommodation; c) tourist services not ancillary to transport or accommodation as stated in art. 36 which constitute the satisfaction of the recreational needs of the tourist, a significant part of the “tour package” (art. 34 Cod. Tur.). The tourist has the right to receive a copy of the contract for the package (prepared in accordance with the procedures laid down in Article. 35 Cod. Tur.). The contract is the title to be able to access the National Guarantee Fund in the cases provided for in art. 20. – reference exchange for currency adjustments to the trip price (Art 40 Cod. Tur.). The tour organizer will also include any further particular conditions in the data sheet. When the contract is signed the organizer will also inform passengers as to the identity of the actual carrier(s) without prejudice to art. 11 of EC Regulation 2111/2005, and its / their possible inclusion in the cd. “Black list” under that Regulation. The proposed reservation must be made on the appropriate contract form, also if made electronically, completely filled in and signed by the customer, who will receive a copy. 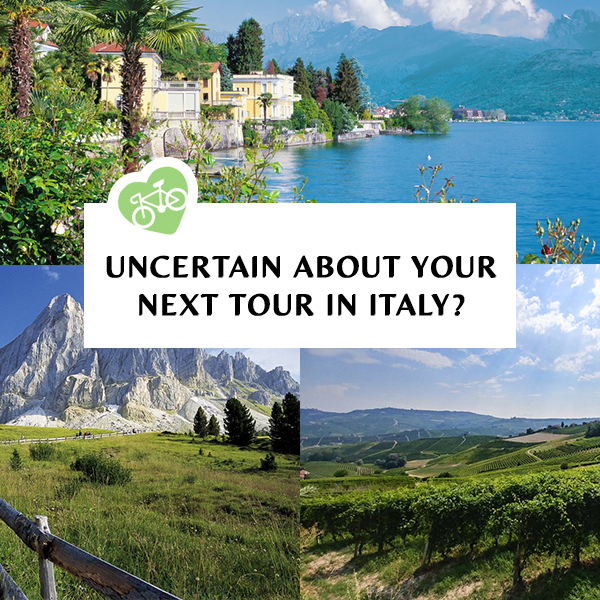 Acceptance of the booking will be complete, resulting in confirmation of the contract, only when the organizer, namely Road Bike Tours Italy, sends official confirmation to the tourist, even in the form of telematic data. The organizer will provide the tourist, before departure, with all information regarding the tour package not included in the contract documents, brochures or other written media, as required by art. 37, paragraph 2 Cod. Tur. under Article. 32, paragraph 2, Cod. Tur., in the case of contracts concluded at a distance or outside of business premises (as defined respectively by Articles 50 and 45 of Legislative Decree no. 206/2005); the organizer reserves the right to provide written notice of the non-existence of the right to withdrawal provided for by Articles. 64 et seq. of Legislative Decree no. 206/2005. The amount of the deposit, up to a maximum of 30% of the price of the package, at the time of booking or on binding request and the date by which, before departure, the balance should be paid are stated in the programme; in particular, the balance must be paid within three weeks of confirmation of the tour by the organizer and in any case within a maximum period of one month before the start. Failure to pay the above-mentioned amounts at these dates, constitutes a termination clause such as to determine the legal termination of the contract by the organizer. For these changes reference will be made to exchange rates and to the above costs in force on the date of publication of the programme. Fluctuations will affect the lump sum price of the package in the percentage expressly indicated in the data sheet of the program. Before departure, should the organizer need to change significantly one or more elements of the contract, the organizer must give immediate written notice to the tourist, indicating the type of change and the consequent change in price. Where the proposed modification, referred to in Paragraph 1 above, is not accepted, the tourist may exercise the right to reclaim the sums already paid or to accept the offer of an alternative tour package under the conditions of Paragraphs 2 and 3 in Article 10. Tourists can exercise the rights provided for above even when the cancellation depends on the failure to reach the minimum number of participants in the program, or in cases of force majeure and unforeseeable circumstances, relating to the tourist package purchased. For cancellations for reasons other than those specified above, the organizer who cancels, (Art. 33 letter e Cod. Cons.) must reimburse the customer double the amount paid by the same. The refunded sum will never exceed double the amount the tourist may owe as of the same date, under paragraph 4 of article 10, in the case where the client demands cancellation. – significant modification of one or more elements of the contract that can objectively be construed as essential to the fruition of the package as a whole and proposed by the organizer after the completion of the contract but before departure and not accepted by the tourist. – the refund of the amount already paid. This refund must be made within seven working days from receipt of the request for a refund. The tourist must communicate his/her decision (to accept the change or withdraw) no later than two working days from the moment he/she receives notice of the increase or change. In the absence of express notice within this time limit, the proposal made by the organizer is considered accepted. The tourist who withdraws from the contract before departure for reasons not listed in the first paragraph shall be charged – regardless of the payment referred to in Article. 7 paragraph 1 – individual paperwork management costs, and a penalty in the amount indicated below, reimbursement for any insurance coverage already requested at the time of completion of the contract or for other services already rendered. In case of organized groups such payments will be agreed on each occasion when the contract is signed. * 30 days before departure penalty of 100%. If the organizer, after the start of the tour ,is unable for any reason, except for circumstances depending on the tourist, to provide an essential part of the services included in the contract, he must provide alternative solutions, without price supplements to be paid by the tourist and, if the services provided are of lower value than those stipulated will reimburse the tourist with an amount equal to the difference. If no alternative solution is possible, or if the solution offered by the organizer is refused by the tourist for proven and justified reasons, the organizer will provide, at no extra cost, a means of transport equivalent to that originally planned to return to the starting point or any other agreed place, depending on the availability of means and places, and will reimburse the difference between the cost of services planned and those already provided up to the time of early re-entry. d) the substitute refunds the organizer for all additional costs incurred, with the sum being fixed before the substitution takes place. e) the transferor and the transferee are jointly and severally liable for payment of the balance due and the amounts referred to in point 4) of this Article. The additional procedures and conditions for substitutions are indicated in the data sheet. Participants must have their own passport or other valid document for all the countries to be visited, as well as visas and transit visas and health certificates as required. Tourists will also have to follow the rules of normal prudence and care and the specific rules in force in the countries of destination of tour as well as all the information provided to them by the organizer, and the administrative or legislative regulations and provisions relating to the package. Tourists will be liable for all damages that the organizer may suffer due to non-compliance with the above mentioned obligations. The tourist is obliged to provide the organizer with all documents, information and evidence in his/her possession that may be useful in order for the organizer to be able to exercise the right of subrogation with regard to third parties responsible for the damage and is responsible towards the organiser for any prejudice caused to his right of subrogation. Tourists will notify the organizer in writing, at the time of booking, of any special personal requests that may be the subject of specific agreements on the travel arrangements, provided that they can be implemented. The tourist is obliged to inform the organizer of any requirements or conditions (pregnancy, food allergies, disabilities, etc …) and to explicitly specify the request for personalized services. The official classification of hotels is provided in the programme or in other informative material only on the basis of the express and formal indications of the competent authorities of the country where the service is provided. In the absence of official classifications recognized by the competent Public Authorities even of EU member states where the service is provided, the organizer reserves the right to provide his own description of the accommodation in the programme in order to permit an evaluation and subsequent acceptance of it by the tourist. The organizer is liable for damages caused to the tourist due to total or partial non-fulfilment of the services contractually, whether these are performed by him personally or by third party service providers, unless he proves that the event was caused by the tourist (including initiatives undertaken by the latter during the execution of tourist services) or by an unavoidable or unforeseeable third-party event, by circumstances beyond the provision of services under the contract, by accident, by force-majeure, or by circumstances that the organizer could not, according to professional diligence, reasonably foresee or solve. Compensation, under Articles. 44, 45 and 47 of the Code. Tur. and relevant limitation terms, are governed according to, and in any case within the limits of, the C.C.V. of the International Conventions governing the services included in a tour package and by Articles 1783 and 1784 of the Civil Code. The organizer is required to provide the necessary assistance to the tourists according to criteria of professional diligence exclusively with reference to his obligations in accordance with law or the contract. The organizer is exempt from responsibility (arts. 15 and 16 of these General Conditions), when the failure or improper execution of the contract is attributable to the tourist or derives from an unavoidable or unforeseeable third-party event, or is caused by unforeseeable circumstances or force majeure. Any failure in execution of the contract must be contested by tourist during the fruition of the package by means of timely submission of complaints so that the organizer, their local representative or guide can remedy the situation promptly. Otherwise payment of damages will be reduced or excluded in accordance with Article 1227 of the Italian Civil Code. The tourist must also make the complaint by sending a registered letter with acknowledgment of receipt, or by other means guaranteeing proof of receipt, to the organizer or intermediary, no later than ten working days from the date of return to the place of departure or will forfeit all rights to any refund. Special insurance policies can be stipulated at the time of booking against expenses arising from injuries. It is also possible to stipulate an insurance contract to cover repatriation expenses in case of accident or illness. For Italian tourists, in general, the tour package includes insurance for trip cancellation. In accordance with the Art. 67 Cod. Tur. the organizer may propose to the tourist – on the organizer’s website or in other forms – alternative ways of resolving disputes which may arise. In this case the organizer will indicate the alternative proposal for resolution of disputes and the consequences of applying it. 21. GUARANTEE FUND (art. 51 Cod. Tur.). The fund must also provide immediately available funds in case of forced return of tourists from non-EU countries whether or not the organizer is responsible for the emergency. Methods of intervention of the Fund are established by President of the Council of Ministers decree dated 23/07/99, n. 349 and refund applications to the Fund are not subject to any limitation period. The organizer contributes to the Fund as provided for in paragraph 2 of Art. 51 Cod. Tur. through the payment of a compulsory insurance premium that he is required to stipulate, a share of which is paid into the Fund according to the provisions of art. 6 of Ministerial Decree 349/99. Contracts covering the provision only of transport, accommodation or any other separate tourist service, cannot be considered as a contractual case of organized travel or tourist package and are governed by the following provisions of the CCV: art. 1, n. 3 and n. 6; Articles. 17 to 23; Articles. 24 to 31 (limited to the parts of those provisions that do not relate to the organized contract) and by other agreements specifically concerning contracts for the sale of a single service. The seller who agrees to provide to third parties, even electronically, a single tourist service, is required to issue to the tourist documents relating to this service, that indicate the amount paid for the service and cannot in any way be regarded as a tour operator. These contracts are also subject to the following clauses of the general contract conditions for the sale of above-mentioned tour packages: Art. 6 paragraph 1; Art. 7, paragraph 2; Art. 13; Art. 18. The application of these clauses does not determine the configuration of related services as a package tour. The terminology of the above-mentioned clauses relative to tour packages (organizer, tour etc.) Is therefore understood to refer to the corresponding items of the sale contract of single tourist services (seller, accommodation, etc.). Technical organization: Road Bike Tours Italy- tour operator based in Sonico (BS) – 25048 Brescia. Partita IVA 03843920988. Company register of Brescia REA CCIAA n. BS- 567649 Aut . dated 15-09-2016. Civil Liability Insurance RC Allianz Global Assistance n.731097084.